Ami Yares joins Rabbi Shawn in creating a dynamic Kabbalat Shabbat service this week. Ami, who joined us at Mishkan Shalom’s previous Sounds of Peace and Justice concert, is a New Jersey-born, Jaffa-living, world traveling folk musician with a knack for making music that moves you physically, spiritually, & politically. Influenced by the spectrum of Americana music, Ami's music reaches out to Israeli & Arab culture in a yet-to-be-named fusion of styles. 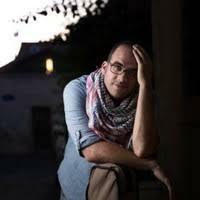 This year, Ami plans to release three recordings; a solo EP, a Brothers Yares EP, & an album sponsored by the conflict transformation NGO, Seeds of Peace, that features musicians from Israel, Palestine, Jordan, Gaza, & the United States (he was a member of the Israeli-Palestinian music project heartbeat). Rabbi Shawn and Ami blend liturgical offerings and musical styles with messages of peace and justice for all.